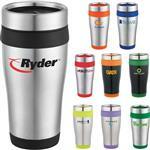 Ventura tumbler - full of color and value! 14oz. Double wall insulation, Stainless outer with color plastic liner, matching color textured silicone grip,Twist closure lid with color slide button drinking spout, Non-slip bottom, Not microwave or dishwasher safe. 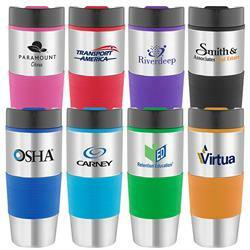 A great promotional tumbler. 14oz. 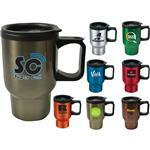 Double wall insulation, Stainless outer with color plastic liner, matching color textured silicone grip,Twist closure lid with color slide button drinking spout, Non-slip bottom, Not microwave or dishwasher safe. 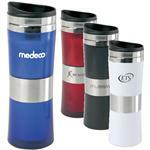 Laguna Double Walled Travel Mugs - 16 oz.